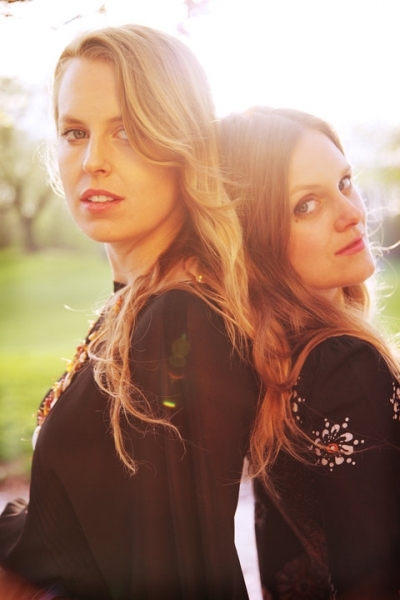 The Chapin Sisters are a Los Angeles-based duo of sisters Abigail and Lily Chapin. The band was formerly a trio, including their sister Jessica Craven, who has taken some time away from performing music for motherhood. The CD Two is their latest release, which came out in 2010 on their label Lake Bottom Records, and it continues the beautiful harmonies displayed on their 2008 LP Lake Bottom. I really enjoy these sisters’ music, and it was a real treat to talk with Abigail Chapin recently. The Chapin Sisters appear at the Vera Project this Saturday, December 4th. The song “Left All Alone” (off Two) is so gorgeous – what do you remember about writing that one? Abigail Chapin: Thank you. That’s one I wrote actually – it came to me in one sitting. I think I was writing it in the car, and I like to record things into my cell phone. We live in LA so a lot of thinking time gets done in the car. I remember playing it for my dad [Tom Chapin] and this is one of the only songs that this is the case that he and I wrote the ending part together. He showed me how to play some of those chords, which was helpful. I should have given him some writing credit on that. On the album our drummer Jesse really added a lot to it. It was definitely different from what I had in my head. How different is it now being a duo, like in terms of writing? AC: In terms of everything. We all wrote songs separately and together. The chemistry of songwriting is different with the two of us. And obviously missing one vocal. Our first songs were all written to be three part harmony and some of these songs on this record were written when Jessica was still in the band – actually “Left All Alone” is one of them, “Palm Tree” is also – so we stuck with the three part harmony in the recording. Jessica sang on those two as sort of a guest – she had already left the band when we recorded the record. We also recorded the record just at the very beginning of our foray into being a duo, so we were experimenting with multiple layers of harmony. Instead of limiting ourselves to two parts we could experiment in every different way. Now that we’ve been touring as a duo we’ve really discovered more about the strengths of that particular format, and what it’s like to do duets. It’s really interesting, and also I think we’ve learned a lot about harmonies and the different ways that plays out. You probably had to use your voice in different ways? AC: Definitely. As a trio, we kind of always had backup singers – a lead singer and two backup singers. As a duo, both people are almost equal. It really makes you able to pick out individuals much more. Were your parents supportive of the three of you going into music? They’ve been very supportive. They’re just the kind of parents that would have been supportive of everything we’ve done, so we’re lucky in that way. They’re excited – they’re big fans. We live in California and they live in New York, and we’ve been on tour in those greater East Coast areas. They drove to Philadelphia to see us play, and then they drove out to Ohio to see us play. They’re taking advantage of the fact that we’re vaguely nearby. But they’re very supportive. I don’t think it’s just because it’s music. I think they’re lovely people and would have been supportive of anything. You moved to Los Angeles from New York about five years ago. Is it weird out there for you? AC: It was a big transition at first. We had this vision that it was really temporary. People from New York always assume that’s where they’ll go back. As we’ve been living in California it’s becoming more of a reality. I’m still kind of on the fence. Also being on the road we’re in New York as much as we’re in L.A. anyway. We go back and forth a lot. What’s your earliest memory involving music? I think it may be a constructed memory because we have a tape of it. We have a tape of Lily and I singing a song that we learned in nursery school. I think it’s an old Israeli song. I can’t remember what the song is about because we both had the words totally wrong, and we’re arguing about what the lyrics are. It’s in the round too, so we were kind of experimenting with harmonies when we were three or four years old. That’s so cute. I read that it was your brother, Jonathan [Craven], who suggested you form a band. AC: Before we started the band, he’d heard us sing together. Jessica’s a lot older than us, and Jonathan is too. When we would hang out together at Jessica’s, Lily and I would always sing silly songs in three part harmonies. Just playing around with it. He knew we could do it. Lily and Jessica lived in L.A., and I was going out to visit them and he said he had this vision that we were gonna record songs in three part harmony. His friend had a recording studio, and we basically picked a bunch of songs and learned them. That’s how it kind of started. One of those songs was “Toxic,” by Britney Spears. A friend of a friend gave a copy of the five songs we recorded to one of the DJs at KCRW. It became a little mini-hit for us and one of their top requested songs of the year on KCRW, which was kind of crazy. You started your own label, Lake Bottom Records. Has this given you more control over your work? AC: We liked the idea of owning everything that we make. The idea that you make something, and it’s basically a work for hire, and then somebody else owns it and has control over everything . . . It seems like in this day and age when it seems like record labels aren’t giving major money advances, and paying you a lot for that control, it seems like if you can swing it to own all that stuff yourself, it’s better. I also read that you were a clothing designer? I would never say I was a clothing designer. I wanted to be but I was never particularly proficient at it. I was a costumer and did wardrobes for commercials and things like that. Until we went out on tour this year with She & Him, Lily and I were keeping our kind of day jobs. It was freelance, so it worked pretty well. How would you describe your clothing style for performing? AC: Performing, especially when we’re local – it’s a little different on tour just because there’s only so many things you can bring with you on the road – we’re a little costumey in our performance wear. When we started out we used to wear white lace kind of Victorian dresses. Our songs in the beginning especially we very stripped down but also kind of dark. We liked the dichotomy of the white dresses with the sad songs. It’s changed as time has gone on. We’re very conscious of our physical appearance on stage. I don’t think it’s superficial, it’s part of the whole performance aspect. We like to play around with different images and eras of clothing. I think it was you who described some of your songs as reverse love songs. How does that work? AC: A couple of the songs on the new record are actually love songs, but we’ve definitely written songs that are anti love songs. They’re about relationships, they’re about feelings, but they’re a twisted version of a love song. “Don’t Love You,” – I think that’s a song where when you’re overstating something, it’s obvious they’re thinking too much about it. What kind of movie would you like to do a soundtrack for? AC: I don’t know. Lily says Picnic at Hanging Rock. Or Suspiria – Goblin actually did the soundtrack. Very different from us. The video for “Digging A Hole” is really cool, especially with that crystal fire. AC: They’re like these crystals that you throw in the fire that make the fire turn different colors. That was actually an amazing experience. It’s the director’s [Aran Reo Mann] parents’ house. She comes from an art direction background, so her strengths are visuals. They had a teepee in the backyard. Written by: Dagmar on 12/01/2010. This entry was tagged abigail chapin, chapin sisters, posted by dagmar. Bookmark the permalink.